Revises and expands on existing rules for magic in Shadowrun, Second Edition and The Grimoire, Second Edition, offers new and expanded rules for adepts, and includes rules for the magical system of voudoun. About Cruz (Author) : Cruz is a published author. A published credit of Cruz is Awakenings: New Magic in 2057 (Shadowrun RPG). About Diane Piron-Gelman (Author) : Diane Piron-Gelman is a published author. 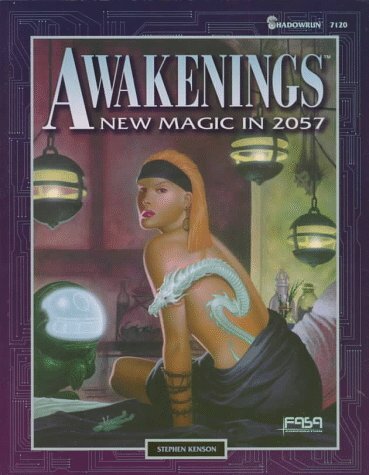 A published credit of Diane Piron-Gelman is Awakenings: New Magic in 2057 (Shadowrun RPG). About Sharon Turner Mulvihill (Author) : Sharon Turner Mulvihill is a published author. A published credit of Sharon Turner Mulvihill is Awakenings: New Magic in 2057 (Shadowrun RPG). About Steve Kenson (Author) : Steve Kenson is a published author. A published credit of Steve Kenson is Awakenings: New Magic in 2057 (Shadowrun RPG).